Unless you’re a dirtbag climber reading this from a tent in Moab, you probably find it hard to get to the climbing gym and even harder to climb outdoors. If this is the case, you can bridge the gap with rock climbing training equipment you can use at home. This can be as simple and cheap as a pull up bar or as complicated and expensive as a home climbing wall. While a pull up bar is not the most direct way to train for climbing, they are an inexpensive and simple piece of rock climbing training equipment that can be effective at targeting a specific need. If you’re finding that you don’t have the upper-body strength or endurance to pull the moves you want to make a pull up bar can help you meet your goals. If you have $20 and a doorway, you can pick up a simple doorframe-mounted pull up bar to get started building strength. Combined with climbing specific training in the climbing gym you’ll soon be able to pull harder and last longer on higher grades and more difficult problems. A training board, also known as a hanging board or hangboard, is a piece of rock climbing training equipment you might not be familiar with. It’s used much a like a pull up bar but instead of a bar it’s a plastic or wood panel covered in pockets. The climber holds onto these and does pull ups. Rather than just training your arms and upper body, the training board also strengthens your fingers. The pockets on a training board range from deep to shallow and wide to one finger to provide a variety of challenges for the climber. While most training boards are permanently mounted to a wall with long wood screws, some training boards are now available that are supported temporarily in a door frame like a pull up bar. This can be great for climbers who can’t leave a training board up all the time or are worried about a security deposit in a rental. Check out the Blank Slate Hangboard at Amazon. A campus board is an unusual piece of rock climbing training equipment that is nothing more than a piece of well supported plywood with smaller boards attached to it at equal intervals to work as rungs. 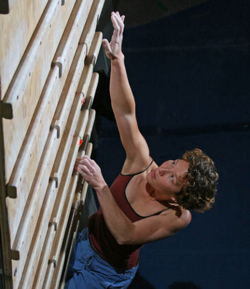 Climbers ascend and descend the campus board using only their hands. Be careful though! The campus board can cause injury. Wait until you’ve been climbing for some time before adding this to your training routine. 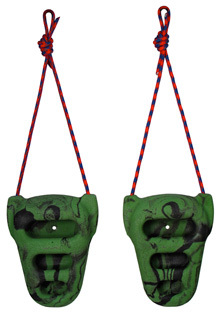 Metolius Rock Rings are a like a training board you can place almost anywhere. This piece of rock climbing training equipment looks like two miniature training boards with a couple of pockets in each. You suspend these with the included ropes from a joist or pull up bar. Check out Metolius’ training plan to see what you can do with them. 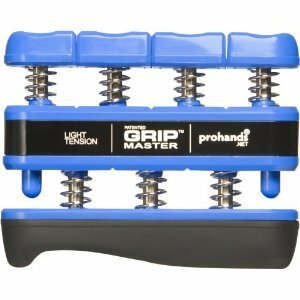 Some climbers who are having trouble improving their hand strength will use hand strengtheners to target their hands directly. Hand strengtheners come in ball, spring, and putty form. Just don’t over do it! Some hand strength training can be helpful but you don’t want to cause injury from overuse. If you can’t get to the gym maybe you need to bring the gym to you. The best piece of rock climbing training equipment is the home climbing wall. The same plastic holds you use in the gym can just as easily be placed at home, provided you can devote the space and build the frame to support them. Check out the home climbing wall below! Looking for more rock climbing gear? Check out What are the Best Rock Climbing Shoes?